How does the design of homes and communities differ across countries and cultures? What makes a home or community a pleasant place to live? In our world where everything is available online, what is the value in traveling abroad? Do the benefits of community based tourism outweigh its negative effects? Scholars discover the tourist attractions of a target language country through brochures, videos and travel websites in Spanish/French. Working in groups, they choose a country to research and prepare a travel brochure advertising its attractions. 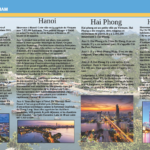 Finally, scholars simulate a visit to a travel agency and, using their brochures and knowledge gained from their research, try to convince a potential traveler to book a trip. Scholars examine text and audio sources presenting the pros and cons of community based tourism and conduct their own research into its effects on the people and environment of target language countries. 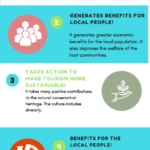 They then engage in a structured debate on the question “Do the benefits of community based tourism outweigh its negative effects?” Scholars use what they have learned to create an infographic promoting the benefits of one form of tourism. This McAuliffe scholar created a custom Google map of Framingham for an audience of French-speaking tourists. The map features must-see locations in the city, accompanied by pictures and descriptions written by the scholar.